Restorative justice is poorly understood in Scotland and its potential for better justice for both victims and offenders, is yet to be met. This special issue offers some context to the current series of dialogues on restorative justice in Scotland funded by the Scottish Universities Insight Institute. Read on . . .
Download a complete .pdf of SJM12. Printing off is best done in colour. 7MB. For mobile and screen reading click the cover image or find us on Issuu at http://issuu.com/scottishjusticematters. Paper copies may also be ordered from that site. We’re running out of funds: this is probably going to be our penultimate issue! If you find SJM useful, please help us keep going by giving a donation for the amount of your choice using the big purple button on the right or buying print copies. Thank you. 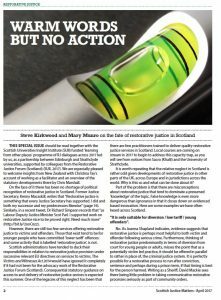 Editorial: editors Mary Munro and Steve Kirkwood introduce the articles in this issue and address myths about restorative justice that block its development in Scotland. Warm words and no action: the fate of restorative justice in Scotland. 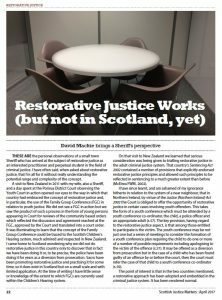 Joanna Shapland reviews what research is telling us about restorative justice and the implications for Scotland. Restorative Justice: the research evidence. Hazel Croall considers the how restorative justice might be a useful response to corporate crime. Corporate responsibility: the case for restorative justice and corporate crime. Criminal justice social worker Rania Hamad considers how restorative justice may be the way forward for hate crime. 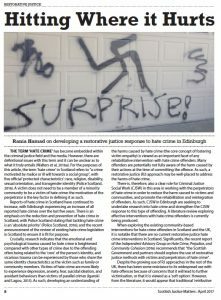 Hitting where it hurts: on developing a response to hate crime in Edinburgh. Ciara Webb adds a note on the collaborative Community in Motion project in Edinburgh and the opportunity it offers for restorative justice with adult offenders. Developing restorative justice services and Community in Motion in Edinburgh. Bill Whyte and Niall Kearney discuss their work with survivors of serious crime and what may be learned from it in terms of the provision of services and good practice. 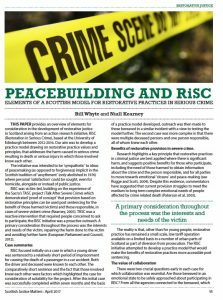 Peacemaking and RiSC: elements of a Scottish model for restorative practices in serious crime. Former police officer, Scott Khalil, now working as Sacro’s Restorative Justice and Mediation manager, describes how he came to realise the worth of restorative justice and reviews the work of Sacro in this area. Key to this is what users are saying about their experiences of restorative justice. “They were on the outside looking in”: a personal reflection. Jenny Johnstone and Ian McDonough reflect on the need for very careful practice in relation to historic child abuse. Restorative ‘Justice’ or ‘Approaches’ and its potential in cases of historic abuse. Researcher Catherine Bisset considers the logic model approach as a way of evaluating the impact of restorative justice projects on both victims and offenders. A model approach: the potential in restorative justice. Former Justice Secretary Kenny Macaskill, explains why restorative justice has not been a political priority in Scotland but now argues that this should change. Is restorative justice languishing on the margins in Scotland? 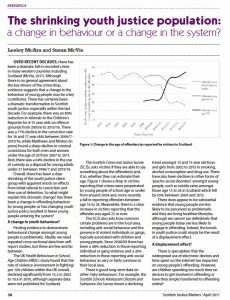 Writing as social workers, David Orr and Stewart Simpson argue that even in youth justice in Scotland there seems to be a decline in provision of restorative services, but that this should be reversed. Restorative justice in Scotland: a youth justice perspective. Sheriff David Mackie, inspired by observations in New Zealand, considers how judical practices in Scotland could be made more restorative. Restorative justice works (but not in Scotland, yet). Chris Marshall of Wellington University, New Zealand, outlines the emergence of both youth and adult restorative justice approaches in that country; their impact and future. Restorative justice in New Zealand. Christina Tay shares some personal reflections on her work as a restorative justice facilitator in New Zealand. The most important thing in the world: a personal account of facilitating restorative justice in New Zealand. 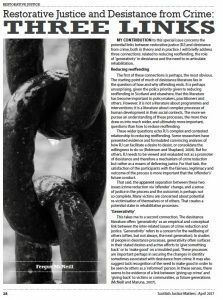 Fergus McNeill considers the potential links between desistance and restorative justice both in theory and practice: reducing reoffending; generativity; rehabilitation. Three links: restorative justice and desistance from crime. Researcher Estelle Zinsstag considers the question of restorative justice and sexual violence, arguing that although rarely take up, the option should be available for survivors who wish to consider it. How appropriate is restorative justice in cases of sexual violence? Cyrus Tata and Fiona Jamieson introduce their work on emotions and the justice system and suggest that an emotionally intelligent system is also more efficient. Just emotions? The need for an emotionally intelligent justice policy. 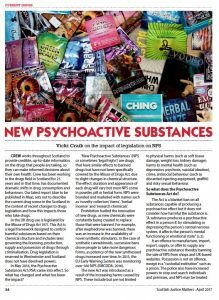 Drugs educator Vicki Craik, summarises changes in the law in new psychoactive substances (NPS) and what is know about consumption in Scotland. New Psychoactive Susbstances: the impact of legislation. Magge Mellon interviews Karyn McCluskey, chief officer of the new Community Justice Scotland and finds that she will be trying to create a movement for change in penal policy. There have been spectacular falls in youth offending recently but, Lesley McAra and Susan McVie ask in their analysis of the figures, is this because young people have moved off the street and online, or because of changes in how we deal with youth crime? The shrinking youth justice population: a change in behaviour or a change in the system? Drugs expert Iain McPhee reviews Trainspotting 2. First there is an opportunity and then there is a betrayal.